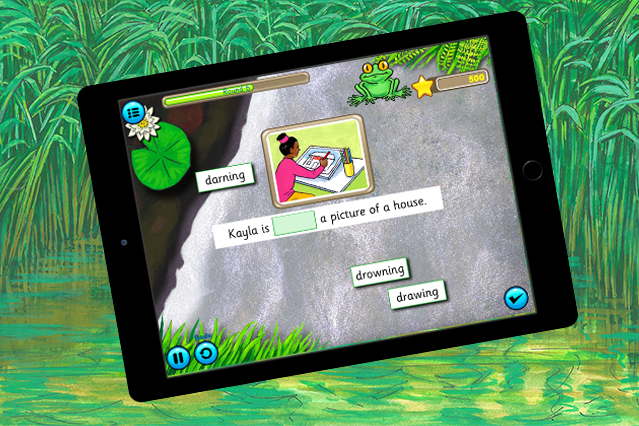 The Froggy Match-it phonics app now has three more levels for Android devices, making it even more useful for phonics work both in the classroom and at home. The new levels deal with alternative spellings for all the main vowel digraphs, for example, ‘clay’, ‘snake’ and‘ train’; ‘beard’ and ‘steer’. This is an important stage in phonics learning, and one that benefits from the practice that a game such as Froggy Match-it provides. There is also a new game at each of the levels 9 to 11. It helps children to practise their phonic skills in context: reading sentences containing the phonic words which are being dealt with. The game involves the player in reading sentences with missing words and, for each sentence, selecting the correct word from three given ones. Many of the words are also multisyllabic, itself important practice. As with the other levels, there are free writing sheets available that complement each level. These can be downloaded at no cost from the website. Teachers have told us that these are excellent for practising writing and consolidating phonic skills, and are particularly useful to send home. The new app is now available for both IOS and Android. At the moment, the revised app is available at exactly the same price, so is even better value. For those of you who have already purchased the Froggy Match-it app, you will get levels 9-11 as a free upgrade. For those of you who don’t yet have the full app, now is a good time to buy.